Unlikely Influences is a series of weekly blog posts about how writers can learn the tricks of their trade in odd places. Most are from guest authors, but this week’s installment is by me. 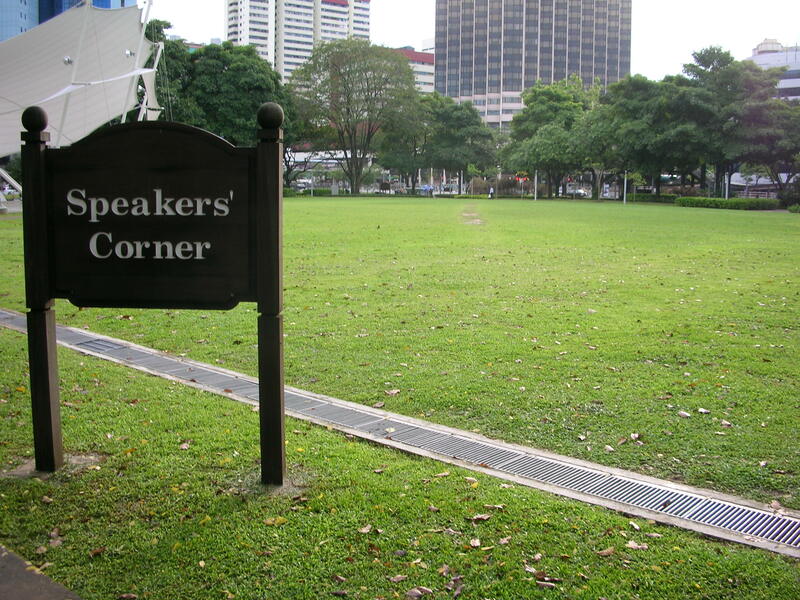 “Deserted Speakers’ Corner – Singapore (gabbe)”. Licensed under Public Domain via Wikimedia Commons. I’ve been writing opinion pieces for a living for about 13 years now, and editing a newspaper’s editorial pages for two. I spend a portion of every day going through submissions. And I serve as a volunteer mentor/editor for both Informed Opinions and The OpEd Project. Here’s what I’ve learned that helps me with fiction too: Saving the good stuff for the end just makes your beginning and middle less good. Remember the high school essay format? There’s a reason that structure works. Sure it’s a formula, but unless you’re a very good writer with a compelling subject, and a reason to deviate, deviating from that formula is not going to work well. So why is it that at least half of the pieces that come through my inbox have the thesis way down at the bottom, if it’s there at all? One reason is that, as another journalism of mine prof used to say, writers write their way to coherence. There is nothing wrong with this – it’s the equivalent of pantsing in fiction. Sometimes we need to work through our arguments on the page before we really know what we think about something. But when you do that, in non-fiction as in fiction, you then have a rewrite ahead of you. You don’t write your way to a thesis, stop, and hit “send.” You say, “oh, that’s what I’m trying to say” and start again. Another reason, I suspect, is that writers think the thesis is the Big Reveal. They worry that if they give it away too early, people will stop reading. No. They do not care what opinions you hold. They do not care what opinions I hold, either. They care about the opinion itself: whether it stands or falls, and why. Here’s how it really works: Reader picks up a newspaper and sees a thesis in the first few paragraphs (or maybe even the headline) that makes them take notice. Perhaps they agree and are getting ready to fist-pump. Perhaps they disagree and are getting ready to sputter. Perhaps – best of all – they’ve never thought about the subject that way. The thesis seems counter-intuitive and the readers are wondering how the writer is going to pull this wacky project off. So they are pulled into the arguments – not because they want to know what the piece is about, but because they want to see how you’re going to handle it, what the implications are. In fiction, we writers sometimes have a similar tendency to want to tell the reader what the book is about on the last page. I don’t mean what it is About in a thematic sense – sure, sometimes that takes a while. But we have a stock of cool ideas and we husband them, keeping them away from the reader in the hope that will fuel suspense. It does not fuel suspense. It just makes the beginning and the middle of the book less cool. If the first 90 per cent of the story is boring, that 90 per cent will remain boring even if in the last 10 per cent, it turns out that the tedious point-of-view character buying groceries was a cyborg monkey all along. “Hey look, cyborg monkey!” is not the end of a story; it’s the beginning of one. What are the implications? How can you take this cool idea and make it cooler? Yes, we should pace revelations for the reader that are also revelations for the characters. That’s real suspense. Interesting stuff about our character’s dark past or current situation should be there early – not in a big block of boring exposition, but enough to hook the reader. I’m not saying a twist ending can’t work, in fiction or in non-fiction. I’m just saying it’s risky, and is not a way to rescue a boring piece of writing from itself. In fiction, I am a natural pantser (even when I outline, alas), so I will often get an idea that makes the world or the character more interesting when I’m deep into the process. If I get the idea while I’m writing Chapter 18, I’ll go back and seed it in, ideally, Chapter 1. We can never take our readers for granted – not for a 600-word oped, and not for a 300-page novel. My mom might read to the end in the hope that I’ll get to the cool stuff eventually. Nobody else will.